A little over two years ago, I did a bunch of posts about the idea of recruiting ‘the next million Mozillians’. My thinking at the time: we need to grow our community dramatically. We need to build even more creativity, reach and resilience into who we are. This is how we build a 100 year organization for the open web. I still believe we need to do this. However, it turns out, finding a million more Mozillians (or whatever number we need) requires more than good intentions and a snap of the fingers. It requires a crisp understanding who we want to recruit and why they’d want to get involved. Getting to this takes time, experimentation and conversation. This list is not a top down set of marching orders. Just the opposite. It’s a pattern I see in experiments and initiatives from all across Mozilla. Experiments and initiatives with serious people and resources behind them. This gives me a great deal of hope. Depending on who you talk to, we have between 25,000 and 50,000 active Mozillians: people who contribute time and passion to making, improving, testing, localizing and promoting Mozilla software. This is an awesome number. But it’s also a number that is hard to grow (or even sustain). Finding your way into this core community is often hard. And some community members feel they don’t get the support they need. Of course, Mozilla has always focused on keeping this community strong. Summits. MozCamps. Community calls. Yet, there is increasing recognition we need to do more. Recognition is solidly turning into action. Mary Colvig has formed a contributor engagement team with this exact goal: doing more. Mike Shaver is looking at ways to optimize how we make software, including a strong community component. David Boswell is trying to improve our Get Involved page. Gerv Markham is working on a community directory for all Mozillians. People like Alina Meirlus and FuzzyFox are investigating ways to make it easier for people to find their way into the Mozilla community. These are only the initiatives that I know about. I am sure there are more. However, just looking at these I am convinced that people in Mozilla are broadly embracing the goal of growing and strengthening our contributor community. If we think about keeping the web open for the long haul, then Mozilla needs to get good at more than just building Firefox. And probably at more than just building software. This is an easy thing to say in the abstract. But what exactly might we do beyond Firefox? What are the threats and opportunities on the web? What do we want to build? Who would want to contribute? Why? Over the last few years, three new groups have formed to address these questions: Mozilla Drumbeat; Mozilla Labs; and Developer Engagement. All have a mandate to innovate and venture into new territory — and to bring new kinds of people into the Mozilla community. What has me most excited is the fact that our once vague aspiration for new ways to participate in Mozilla started to become more concrete. The path to becoming a Mozilla / P2PU School of Webcraft course leader is clear (but clunky). The idea of Mozillian as news hacker is coming into focus. The chance to pitch in on Mozilla innovation thinking through a Labs Design Challenge is well established. Also worth noting: many of these ‘beyond Firefox’ initiatives have started to become Mozilla community software projects. The Popcorn and Butter hypervideo tools. The processing.js toolset developed by Seneca and others. The Batucada open social platform we’ve developed for Drumbeat. All small scale, but notable as software projects aimed at the challenges and opportunities we face today on the web. While all of these initiatives are interesting in their own right, the bigger story is about community. As they scale, these initiatives will allow many more people to contribute and become Mozillians. This is critical for growth. Ultimately, it’s the difference between being able to support 50,000 contributors and 500,000 contributors. Growing our community means expanding the number of things they can work on. Slowly, this is starting to happen. Personally, I believe that we need a third strategy for growing our community: a way for large numbers of people to simply stand up and support Mozilla. To simply show their affinity. The main reason: this is the best and fastest way to spread our message, to explain to the world that we are more than just a browser. We know from other movements that ‘joining’ turns supporters into informal evangelists. They wear tshirts. They feel pride. They talk to their friends over dinner about why. The other reason is that simple ‘support us’ programs are almost always the best way to scale a community of active volunteers and contributors. We saw this in the Obama campaign. And in online environmental organizations like 350.org. First people make a small pledge of money or affinity, then the most active are invited and supported in doing much more. Traditional campaigners call this a ladder of engagement. Mozilla is trying to build this kind of supporter base through ‘Join Mozilla‘, newsletters and a number of other user engagement programs. The strategy is simple: we want people with a strong affinity for Firefox to understand that we are about something more, and then to express their support for our cause. Of course, we can do much more once people have joined. We can activate supporters as informal evangelists. We can invite them to local meet-ups or parties. And we can encourage the keenest amongst them to become active Mozillians. And, if we look at other campaigns and movements, it’s clear that the starting point needs to be very simple. And, its still fantastic for the cause that the broad majority of people will be happy to do no more than just show their support. Mitchell has talked informally about 2011 being ‘the year of community’ for Mozilla. I agree. When I look at the rough community strategy that is emerging across Mozilla, I think the opportunity for major growth is real — it’s an opportunity we can’t miss. I believe the Whistler goal of 1000x-ing the size of our community can actually be achieved. The caveat: we need to dive in and take some risks now to make this happen. We need Mozillians from around the world to take a leap of faith — that we can scale our already awesome global community into a community that’s even more diverse, powerful and world changing. Practically, this means moving quickly on everything from a community directory to innovation challenges to Drumbeat projects to the new Join Mozilla program. It means trying things and then trying them again, even if we don’t get them right the first time. As I say, I’m pretty hopeful about this. It’s exactly what the Mozilla community is good at. Today’s my last day at a computer before two weeks off the grid. No electricity. No phones. No computers. The best two weeks of the year. Is now the right time for Mozilla to start engaging large numbers of new people in stewarding the open web? I think it is, but am interested in diverse opinions. 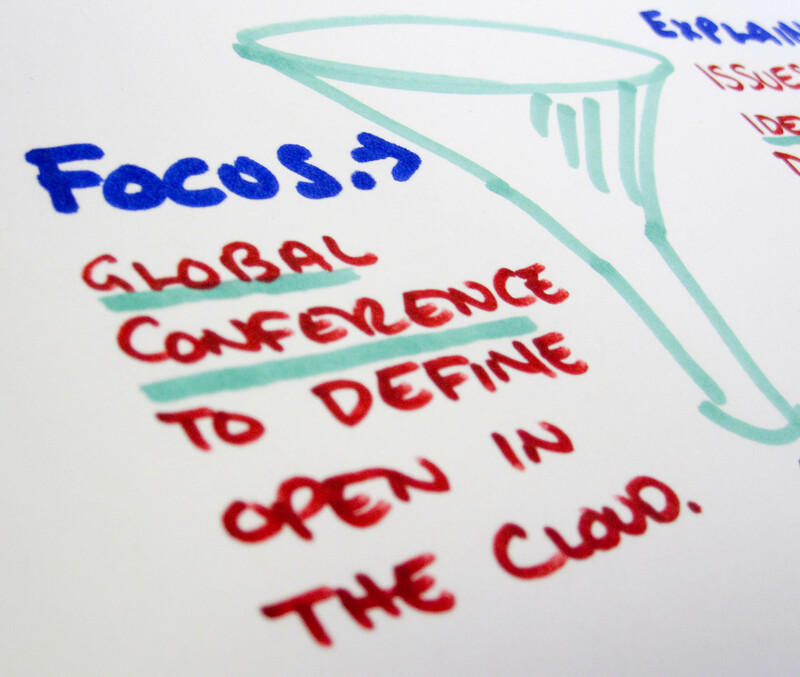 Are issues like security, freedom in the cloud and open mobile good places to start? Or are there other issues that you think large numbers of internet users need to know about and take action on? What other orgs and groups we should be supporting, building on and working with? We’re already committed to working w/ One Web Day. We also need to connect to orgs in the specific issue areas where we want to work. The idea of engaging the next million Mozillians has been floating around for almost a year now. My belief is that it’s time to begin experimenting and taking action on this front ASAP, starting in September or October. This is something the Mozilla Foundation team will be prioritizing. In order to move quickly, we need your ideas, tough questions, critiques and offers of help over the coming weeks. Blog comments, pingbacks and private email are all good ways to share thoughts. Talk to you in two weeks. Recently, I’ve found myself in more and more discussions about identity, data and freedom in the cloud. Zittrain did a great op-ed a few weeks back that suggests why: the cloud brings us wonderful social connections and new applications, but it also has its dangers. Personal dangers like data and identity lock in. And web-wide dangers such as limitations on the freedom to innovate. A few people have been talking about this for a while. But, for most people who use the web, this issue is just coming on radar or isn’t there at all. Most of the discussions I’ve had centre on questions like: what does freedom and openness in the cloud look like? Do we have it already? If not, how do we know it when we see it? What’s the litmus test? These are the kind of tough internet questions that Mozilla community could usefully dive into — with product, and also as part of our engagement with the next million Mozillians. Imagining exactly what this would look like is more difficult than with an issue like web privacy and security. It’s not just a matter of educating people and encouraging them to act. A longer process of convening, thinking and testing out ideas would be needed. 1. First step: get 100,000s of people to ask ‘what am I getting and what am I giving up as I move my digital life into the cloud?’ This creates broad awareness of the fact that there is even an issue here. One way to do this would be to tap into BarCamps and other grassroots tech events that already happen around the world. Framing the right conversations and even doing some basic education work through events like these would get the questions of identity and data in the cloud on more people’s radar, including local press. An online component connecting all the local events could be added to thread everything together. This is the top of the funnel: a very broad global conversation that bubbles up new ideas and helps to identify people who want to go deeper in these issues. 2. Next: a more focused process to define what we mean by ‘open’ for products and platforms in the cloud. This could take the form of a major global conference that brings in people and ideas generated at the ‘top of the funnel’. It would also gather key web industry players and open source projects who are shaping what the cloud looks like. An event like this would amplify and focus the broader conversation while at the same time generating concrete ideas people can act on. What concrete things? New alliances that make our cloud identities more portable? A new technology hacked together during the conference that makes OpenID easier to use? 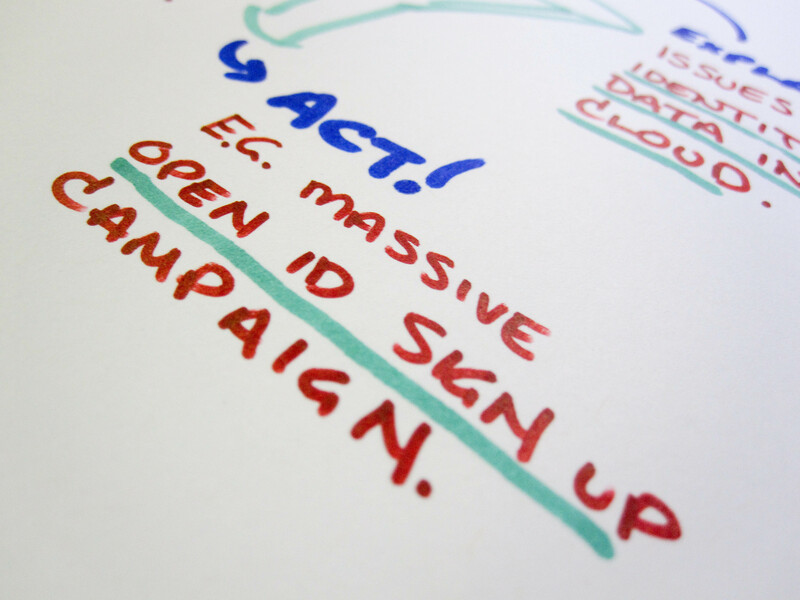 Simple, clear ideas on actions consumers can take to maintain their freedom in the cloud? It’s hard to know until you do it. 3. The final step is the get millions of people taking actions that concretely promote openness in the cloud. From where we sit now, one can imagine things like a massive OpenID sign up and education campaign, or getting people to sign onto some sort of cloud users bill of rights. But these things seem quite small. The idea would be to develop a number of much more substantial actions — and possibly products — that make it possible for people to actually move the bar on the open cloud in a meaningful way. I have no doubt that we can design actions that pass this test, but we need the kind of convening, thinking and inventing described above to get there. When I put the privacy and security example through my funnel yesterday, it felt pretty concrete — getting 100,000s of people involved in making the web safer and healthier is something we can define and then go do. This identity, data and freedom in the cloud example feels squishier. It’s more like a ‘how-to’ on holding a global conversation that eventually leads to products and massive consumer action. This might make some people uncomfortable. Me, I think it’s okay. If we want to dig into the tough issues that will face the internet in coming years, we need a plan. And then we just need to get started. Which leads me to some questions: does the process described above feel like something Mozilla could and should do? 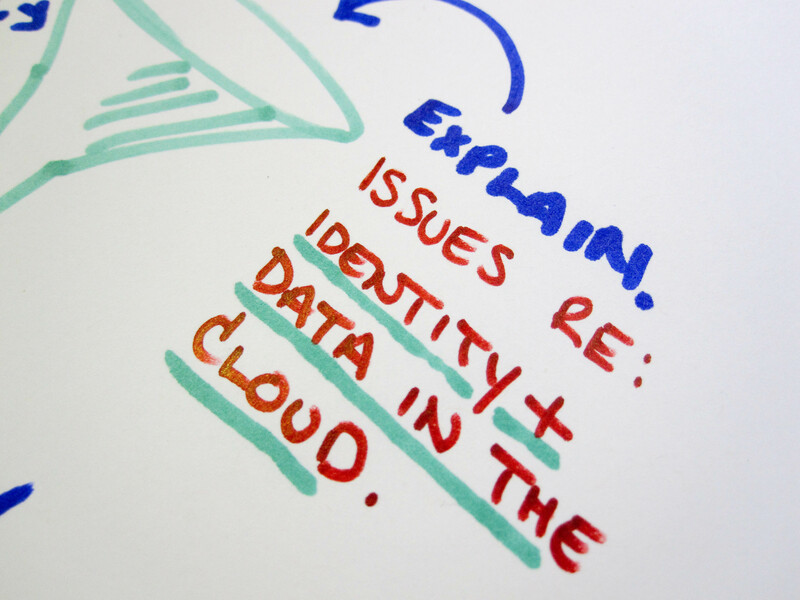 Are the questions of identity, data and freedom in the cloud something Mozilla should take on? Are there other ‘tough internet issues’ that we could tackle with a process like the one described here? I would love to hear what people think. Privacy and security have always mattered deeply for Mozilla. They are central to the health of the internet at both the individual and web-wide level. For this reason, pushing the envelope on privacy and security has been a core consideration in Mozilla software since early on. One challenge: most people who use the internet don’t care very much about privacy and security. Or, at least, they don’t understand it. Good product, technology and UI help to counter balance this, keeping people more secure. But this only goes so far. At some point, we need people to care and act. Could we educate and engage large numbers of people to actually help make the web more secure? Other kinds of public benefit organizations ask people to help clean up beaches or promote public health. Could we do the same for the health of the web? 1. 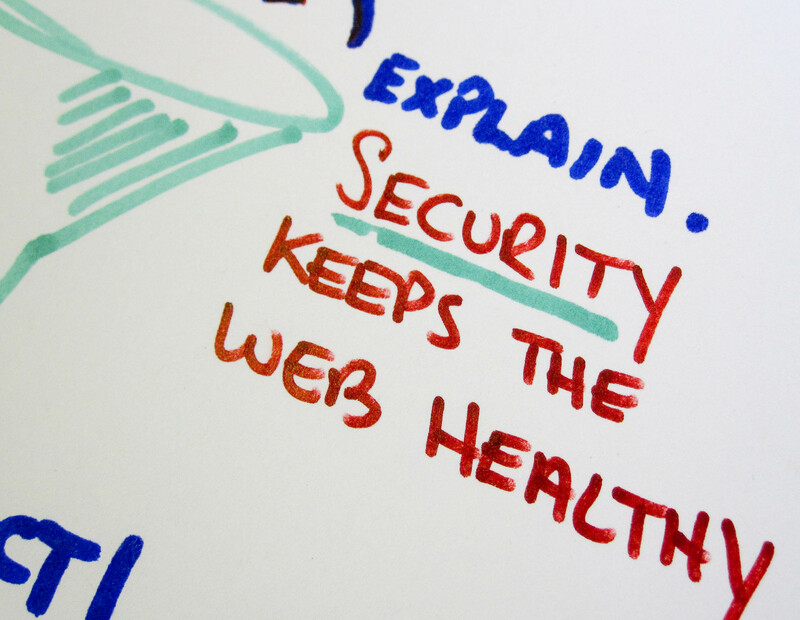 Explain that good privacy and security practices keep the web healthy. This is obvious to anyone who has anything to do with Mozilla. But it isn’t obvious to most people who use the web. In some ways, this is similar to where we were with seat belts in the 1950s: we had the technology to keep people safe, but people didn’t think buckling up was important or necessary. Coming up with a simple, easy to understand social marketing campaign on privacy and security wouldn’t be hard, and would probably go a long way. We could start out by using events like Mozilla Service Week and One Web Day (both happening this fall) to promote these messages. 2. 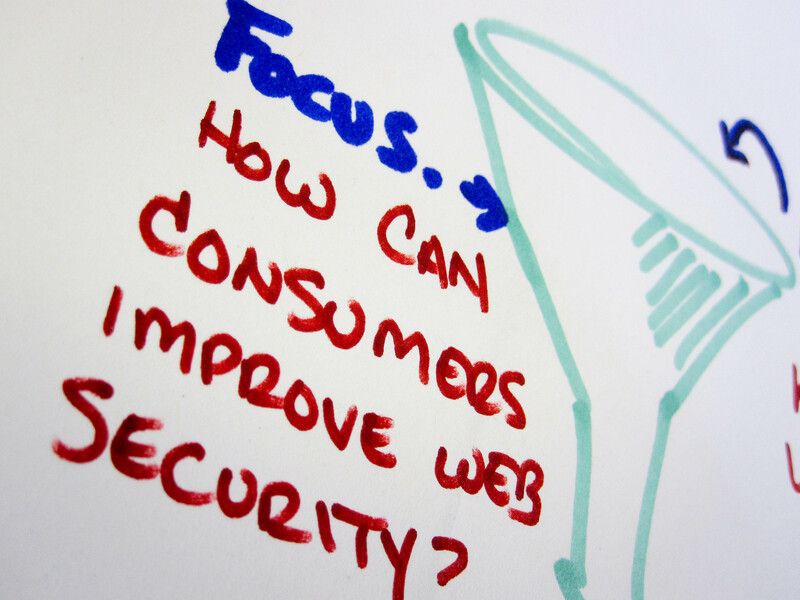 Organize a conversation within the Mozilla community to focus and define actions consumers can take to improve web security. Simply getting people to care is not enough, we also need them to act. This means coming up with a list of things that we ask people to do. At one level, making this list is easy: upgrade your browser and plugins, understand security UI, etc. However, there may be other things that we want to do that require a bit more organization (e.g. a new web safety add-ons collection) or even better technology (what about improvements to password management?). In any case, the middle step of this process definitely needs to be tapping Mozilla community expertise to make sure we’re asking people to take actions that actually help the web. 3. Design a simple way for 100,000s of people to audit and upgrade software that represents a threat to the web. This could include things like: finding copies of Internet Explorer 6 and upgrading them to a modern browser; making sure the Flash and other plug-ins are up-to-date on the computers of friends and family; encouraging people to install add-ons that improve privacy and security. We know from events like Download Day that we can get the attention of large numbers of people. An ‘Internet Health’ checkup program like this could harness the same spirit in a way that improves the web in a tangible way (e.g. measurably drop IE6 usage). And, of course, it could include many of the same techniques of tracking progress around the world or even holding competitions to drive momentum. I’ve chosen this example because it’s close to home for Mozilla and it’s something we could act on quite quickly. It feels like a good first topic if we want to experiment with engaging the Next Million Mozillians. Other topics like identity and data in the could or opening the mobile ecosystem will be harder and require more time to flesh out. Tomorrow I will go through one of these examples in detail. In the meantime, I want to ask: does it make sense for Mozilla to engage people on privacy and security issues in this manner? If so, what specific messages or actions would you focus on? If not, why not? 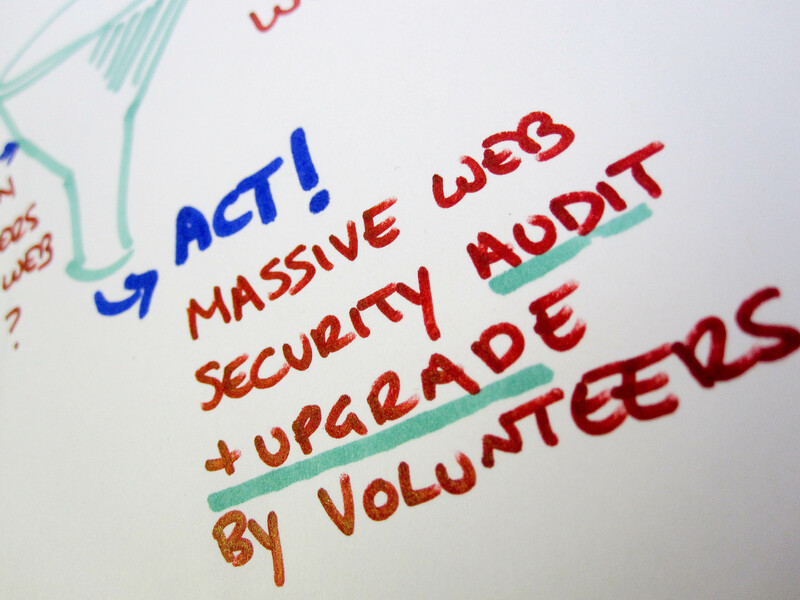 Earlier this week, I posted some updated thoughts about ‘the next million Mozillians’. My argument: Mozilla is in a better position than ever to invite millions more people to actively love, protect and steward the open web. Great sentiment, but how do you do it? We need to explain the ideas and issues we care about. Privacy and security. Open mobile. Identity and data in the could. 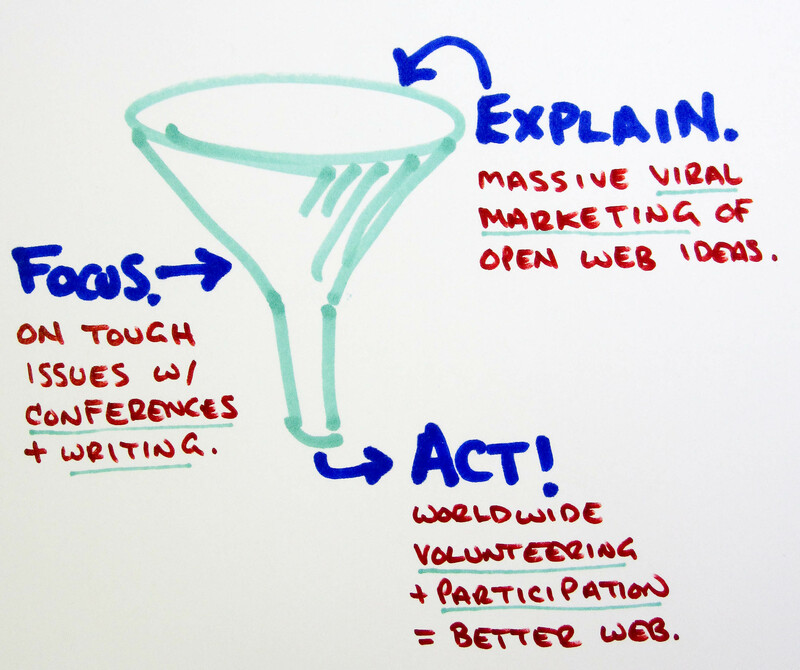 Even the basic concept of why the web needs to be open. Doing this will require a mix of clear, simple messaging, viral social marketing and a vibrant local ground game. Think: focused, noisy and inspiring conversation online and in coffee shops everywhere. That’s the top of the funnel. Of course, a broad conversation isn’t enough to drive concrete action. We also need a way to focus and define ideas, actions and even new products people can use to make the web better. The shortest route: conferences, writing and other activities that bring the best brains together around the toughest internet issues. In areas like privacy and security, the existing Mozilla community could drive something like this on it’s own to make quick progress. With things like identity and data portability, we’d want to reach out, include others and take more time. This is the middle of the funnel. The rubber really meets the road when we have 1) a list of simple, powerful actions that can make the web better and 2) millions of people who care enough about the open web that they want to pitch in. These ingredients let us encourage people to do things like upgrade insecure software, move their friends into the open cloud or call out for an open mobile ecosystem. To volunteer, educate and participate. This is the bottom of the funnel. Of course, this is just a framework, and a very embryonic one at that. In my my next two posts, I will run a couple of examples through this framework in more detail. One will be a web health audit and security campaign and the other will look at identity, data and freedom in the cloud. My goal is to test the framework and get reactions to specific examples of things Mozilla might do. For a while now, I have had this feeling: we need to get millions more people to actively love, protect and steward the open web to keep it vibrant over the long haul. Mozilla is in a good position to make this happen. Most Mozillians I’ve talked to over the past year agree we need to get more people involved. But the ‘why’ and ‘how’ often seem squishy. What would a million more Mozillians do? How could they genuinely make the web better? What challenges does the web face that technology alone cannot resolve? These are tough questions. The thing is: tough questions shouldn’t scare us. They should encourage us to dive right in. 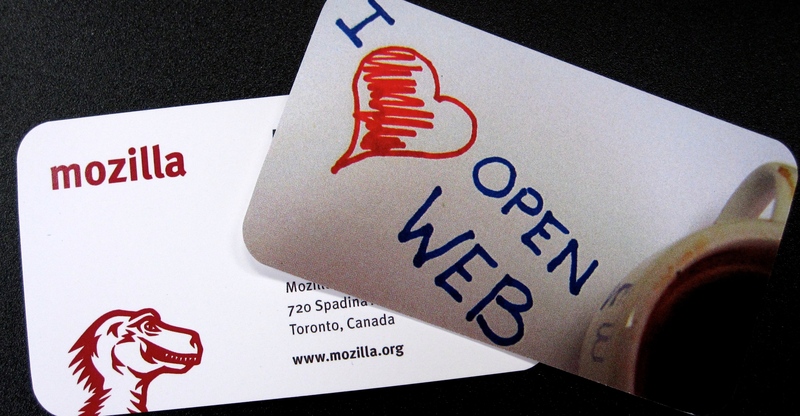 Mozilla and others have helped build an open, participatory web. It is a wonderful, amazing thing. However, technology alone may not be enough to preserve the web we’ve built. Everything from privacy and security to data portability in the cloud will represent serious challenges in the future. The millions of people who use Firefox could get involved in responding to these challenges. Mozilla is in a better position than ever to reach out to millions of loyal supporters to a) explain why an open web matters and b) invite them to participate actively in making the web better. My feeling is that it’s time engage people in this way, and that we should take our first steps by touching on issues that are close to home. One small example: imagine a significant community marketing campaign on the importance of security and privacy to overall internet health. And then maybe a related ‘internet health audit’ campaign where new Mozilla community members mobilize to eliminate IE6, old plugins and other security risks on the computers of their friends and neighbors. Small tasks, but real participation and real benefits for the web. Over the next few days, I want to flesh out this example and a few more. The opportunity here is huge and very long term. However, I believe we’ll only know whether and how to proceed by digging into some real and immediate examples. In the meantime, I’m interested to hear: do others think this is as important as I do? Last week, David Eaves blogged about the potential for Mozilla to energize — and maybe even lead — a mass movement for the open web. My response: hear! hear! More thinking, experimenting, conversing, inventing, definitionizing, evangelizing, politicking, standard-making and party-throwing in the name of the open web is very much needed. And Mozilla is certainly well situated to stir this pot. What would it take to stir the pot? Probably a re-imagined and re-invigorated Mozilla Foundation. Currently, the Foundation acts as steward for Mozilla Corporation and Mozilla Messaging,which are owned by the Foundation but run with their own leadership and resources (I like this model). It supports a handful of other Mozilla software projects. And it gives out a small number of grants related to open source and web accessibility. All of these things contribute to the open web, some (stewarding Firefox!) in a massive way. The Foundation should keep doing these things. Yet, there is still space for the Foundation to be thinking bigger. Looking for the next risky, audacious, disruptive ideas that will make the open web more useful and more fun. Strengthening not only the technical building blocks of the open web (software and standards), but also the social ones (community and business models)? And, getting ordinary people excited about the open web and why it matters? Which is where this idea of a movement comes in. If Mozilla stepped into the movement building game, it would clearly have a head start: 170 million people who use Firefox and a killer track record building community. However, there is also a critical piece missing: the ability to help large numbers (millions?) of people make the shift from being a consumer to being contributor. Not contributors to Mozilla Project code. Or even to documentation or marketing. Rather, imagine 170 million contributors to the project of making the open web stronger, better understood and more resilient. This would be very cool movement indeed. This week’s Downlod Firefox campaign demonstrated that, at least on the company side, Mozilla has the horsepower and respect to galvanize large numbers of people. Over 8 million people downloaded Firefox 3 in a day. In some ways more impressively, 1.6 million pledged to do so in advance. These pledgers care about Mozilla, and want to chip in to making the web more open.This problem is, beyond downloading, there is very little for ordinary, not-so-techie folks to chip in on. Mozilla Foundation could change this. It could invite people en masse to help define what we mean by the open web (really, we need to work on this). It could encourage them make videos, mashup pictures and write blog postings that explain the importance of the open web to my grandmother (or my kids). And, over time, it could give people — geek and non-geek alike – the scaffolding and encouragement they need to invent new pieces of the open web that have not yet been imagined. Pieces that use openness and participation to make the web better for work / music / life / love / play / the-stuff-that-matters. Imagined this way, the Foundation has the chance to create the next million actively contributing Mozillians. I think it should take that chance. Which isn’t to suggest that Mozilla should drop its driven focus on great, community-built tech products. Not at all. Firefox and other Mozilla products are critical to keeping the web open. 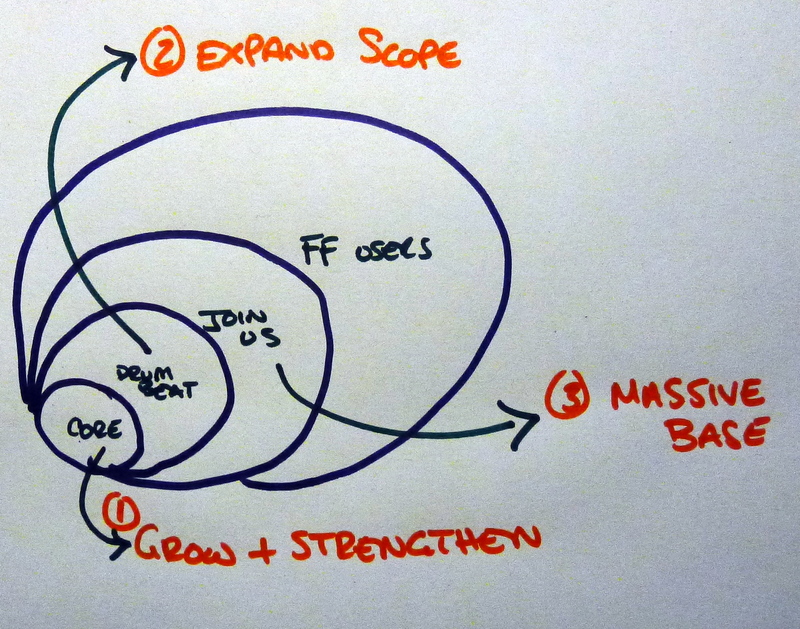 However, one can imagine the Foundation as movement yin to the Corporation’s awesome product yang. Parts of a whole. As somebody whose job at Shuttleworth is to make the world better using open source tactics, thinking through this version of the Mozilla Foundation fascinates me. I’ve shared this fascination with a few Mozillians, asking: if the Foundation were in the movement building business, what would it look like? Where are the geek (and not just Firefox) and non-geek (and not just marketing) sweet spots for the next million contributors? I have to admit, I don’t know myself. I have vague hunches (above) and a desire to dig deeper. I’m hoping the Mozillians I am talking to have ideas to share. And maybe you do to. If so, I’d love to hear them. I promise to post again to pull together any good ideas that emerge. You are currently browsing the nmm category at commonspace.